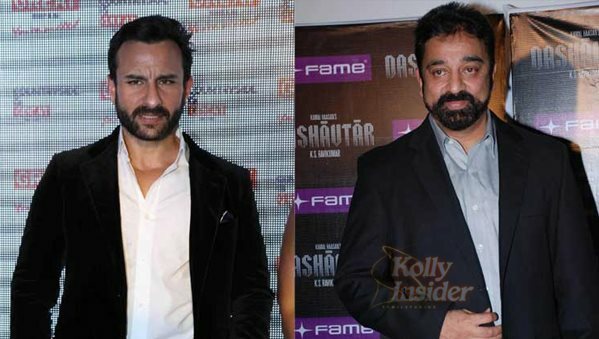 Actor-filmmaker Kamal Haasan will be teaming up with Bollywood actor Saif Ali Khan for Hindi action-thriller Amar Hai. The film will be helmed by Kamal himself and will touch upon modern day politics, finance and the underworld. Kamal Haasan, says his role in the movie will have a unique outlook. "My character, though not that of a conventional antagonist, would present a point of view that is far from ordinary," Kamal said here. The film will also feature Saif Ali Khan, and it is an intense tale based on politics, business dynamics and underworld equations. The story travels from Mumbai to North India and traverses some picturesque international cities as the plot progresses. The producers, along with the film’s mastermind Kamal, are exploring shooting locations in Mumbai, Delhi, London, Dubai, Jordan and parts of the US. Being produced by Virendra K Arora and Arjun N Kapoor, the project will be a two-hero project. Two actresses will be cast for the movie, but the names are yet to be finalised. “Amar Hai is special to us in many ways. One, it is that iconic project which is sure to mark the much awaited Kamal Haasan working for Hindi cinema. Two, the film will see Kamal Haasan wearing multiple hats, that of an actor and a director on a story penned by him. And three, from the outset of scripting this film since the past six years, Kamal Haasan has had Saif Ali Khan in mind for the lead role and the actor has been clued in about his involvement on the mega project,” the makers said in a statement. Kamal is currently shooting for Tamil thriller "Thoongaavanam", while awaiting the release of another thriller "Papanasam". "Amar Hai" will be actor Kamal Haasan direct Hindi film in 18 years, after "Chachi 420". Most of his popular tamil films, including "Vishwaroopam" was dubbed in Hindi.